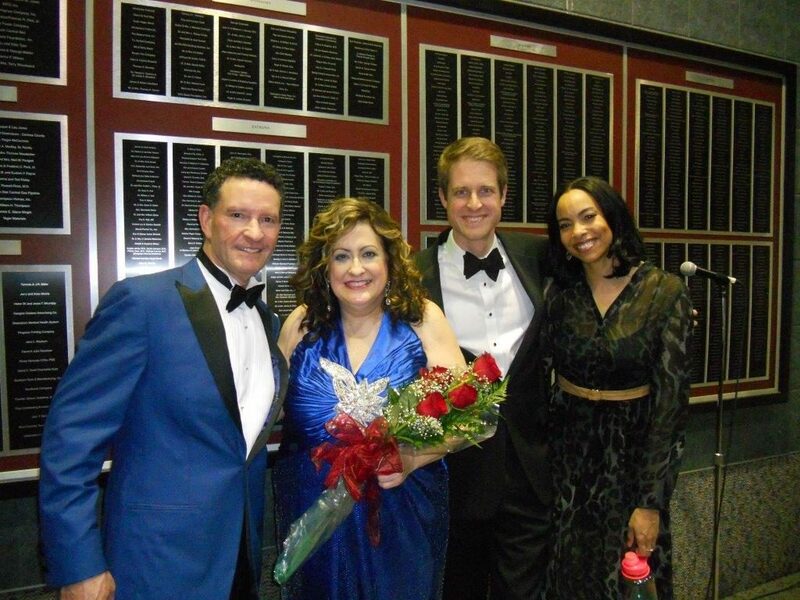 On April 16, 2016, the Owensboro Symphony Orchestra featured four Kentucky Wesleyan faculty during the 50th season finale concert – Nicholas Palmer, Diane Earle, Bradley Naylor and Lisa Clark. Kentucky Wesleyan College music faculty at the April 16, 2016 Owensboro Symphony 50th season finale concert. From left to right are Nicholas Palmer, Diane Earle, Bradley Naylor and Lisa Clark. Read more about this outstanding event for the Owensboro Symphony and Kentucky Wesleyan below. George Gershwin’s “Rhapsody in Blue” is perhaps pianist Diane Earle’s favorite piece of music to play. She has played the composition all over the world, and on April 16, she will again perform it during the Owensboro Symphony Orchestra’s finale performance. “A Gershwin Celebration” will wrap up the group’s 50th season. “(Rhapsody in Blue) has so much soul and passion in it,” Earle said, that she is excited to be able to play it for what will be current OSO Music Director and Conductor Nick Palmer’s final performance of a subscription concert. Palmer has been the orchestra’s conductor for the last 17 years. When his contacts ends June 30, he will be heading to Charleston, South Carolina, where he will become the new music director for North Charleston POPS! The finale concert will be bittersweet for Palmer, he said. The group will also present popular Broadway pieces from Leonard Bernstein’s “West Side Story,” “Candide,” Gershwin’s “Porgy and Bess” and more, as well as feature some Kentucky Wesleyan College guests, vocalists Bradley Naylor, Lisa Clark and Tevin Vincent, and the Musick Studios All Stars.